Tank cleaning is essential on a chemical tanker, but it must be recognised as a potentially hazardous operation, which involves special Hazards such as Fire, Explosion, Asphixiation etc. It is therefore of utmost importance that the greatest possible care is exercised in connection with all tank cleaning operations to avoid accidents and incidents. 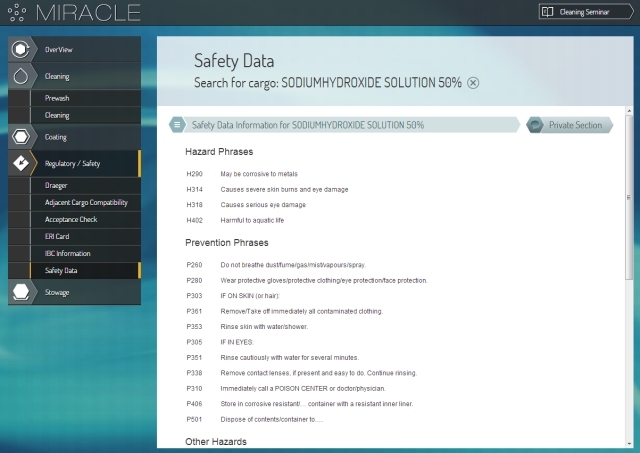 The MIRACLE Safety module provides MSDS data of the selected cargo consisting of Hazard Phrases and Prevention Phrases.